Santa is the main attraction, but there are many other activities at the Christmas at the Museum celebration. Visit with Santa, have a profile done by the Silhouette Artist, make holiday crafts, do the Christmas scavenger hunt, play games and more at the annual Christmas Celebration at the Union County Heritage Museum on Saturday, December 8, 10 – 12 noon. The Historic Northside District Garden Club partners with the museum for this annual event. Parents are invited to bring their children to visit with Santa and have cameras on hand to take photos. 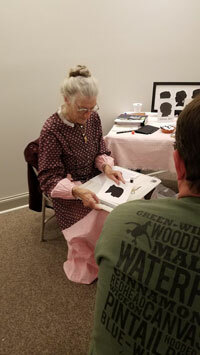 Artist Sara Rick, who is a member of the Mississippi Craftsman’s Guild, will be at the event cutting silhouettes of children. Appointments may be made for sittings. Cost of a cut silhouette is $25. This an almost lost art form which was once a way to capture a person’s likeness with a shadow portrait. 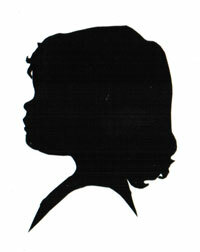 It later was called silhouette after a French aristocrat. To make an appointment with Mrs. Rick call the museum at 662-538-0014. “Sara has been at the museum in years past, and people have enjoyed her work. It is a good opportunity for people to have a unique portrait and great Christmas gift created. The sittings take approximately 15 to 20 minutes. Other activities available include a family make and take Christmas craft, the annual scavenger hunt and the themed Christmas trees and the candy cane hunt. The event is free and is made possible by the Community Partner Program of the museum. The museum is located at 114 Cleveland Street, New Albany. For more information call 662-538-0014. New Albany's Hudson Hickman worked with Dolly Parton to produce the true story of "Dolly Parton's Coat of Many Colors"